Hi, Rikki here and I am excited as this is my first post for Stix2 Anything and my first tutorial I have ever done hope you enjoy it. With the heat over here in the West seeming like it will never end I thought that it would be great to do a layout about Summer, and when I saw the Stix2 A4 Masking sheets I knew what I wanted to do and hoped that it wouldn’t get lost in translation (and you will be pleased to know it didn’t). For this you will need to decide what your background colours will be I would recommend 2 to 3 colours at the most. 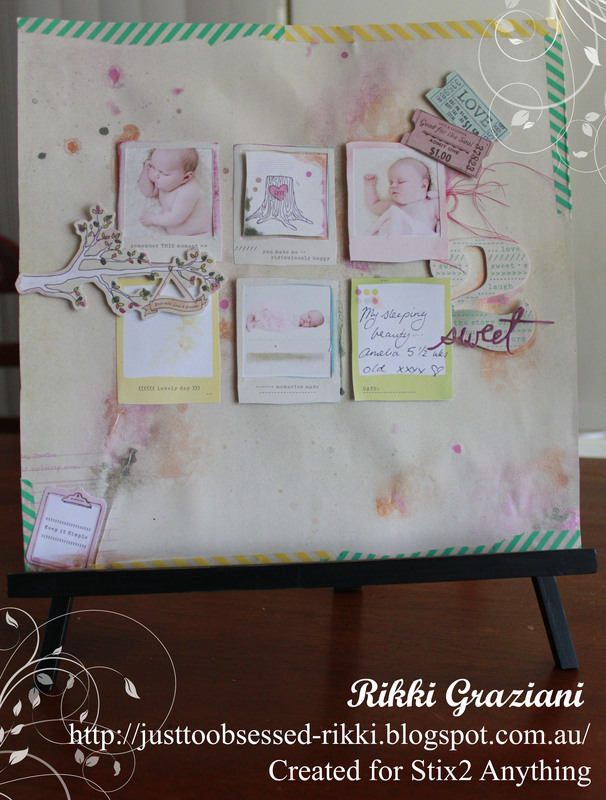 Once you have done that, grab your Stix2 non-stick crafting sheet and here we go…. Grab a piece of cardstock and texture paste and apply it all over your cardstock as your working add some texture, for this one as you can see I used a kitchen spatula. For this layout I wanted to make a large Chevron background so grab your masking sheets and measure out your strips ( you will need to divide the 12×12 layout into 2 so you can use the A4 sheets), the gaps are around 5 cm apart and equal. Because the layout has the texture paste you will need to use a scraper or something like that to push the sticky side of the Masking sheet down – pay attention to the edges. Complete your whole page…..
Lay your masking sheet on the centre line and follow the side of the triangle to get your first strip then measure 5cm along the masking sheet to get your next line and follow that along making sure that the line is perpendicular to the last, once you have completed the whole sheet use your cutter and cut them out…..
Once you have cut them out stick them on the page missing ever second strip so you have something like this below…..
Now you have your whole page masked off its time for the fun stuff, for this layout I used Tim Holtz Distress inks Peacock and Salty Ocean. Starting off with Salty ocean work your way around the page where you haven’t masked off, start off light and as you build it up add-on more ink to make it darker. Once you are happy with the blue start adding in the peacock colour doing the same technique by adding in darker patches so you will end up with something like the photo below…..
Also at this point you can add in some little mists of your favourite brands I used Dylusions mist as it co ordinates with the inks. Now with your blue ink work over the top of the white chevron pattern making sure you the inking nice and pale……. so you end up with something like this….. This is your background completed now we move to the layering part. 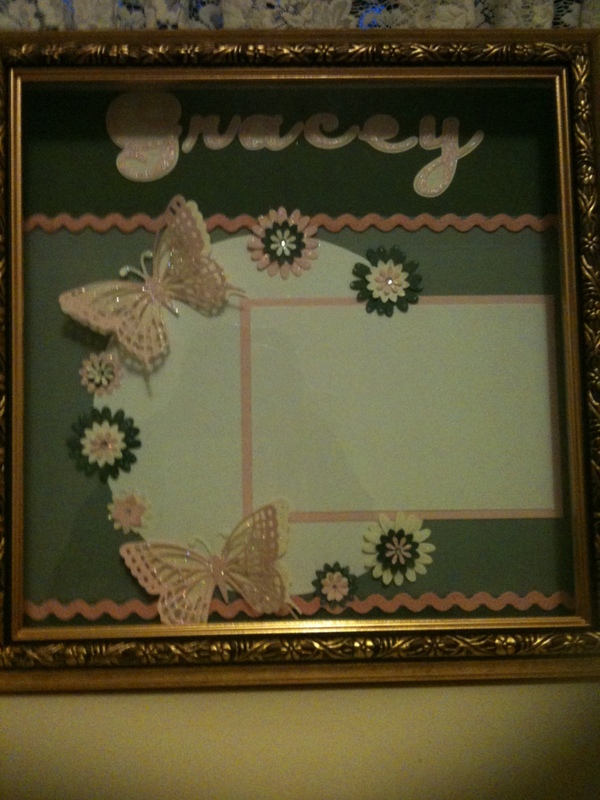 So grab all your embellishments and pattern papers cut them to the sides you need. The key is to position all your elements and not stick it down. Once you have you layout take a quick picture with your phone or camera so you remember where to stick everything. The key to layering is figuring out what you what to highlight and use your Stix2 A4 Double Sided Foam mount sheet cut up what you need into strips or like in the stars case I just stuck it on one of the sticky sides and cut around the star. So once you have figured out all your layers and foam mounted all your embellishments and papers and photo its time to construct…..
For your first layer use the foam mount in strips remembering to add one in middle so as you add the other embellishments it won’t collapse in the middle…. 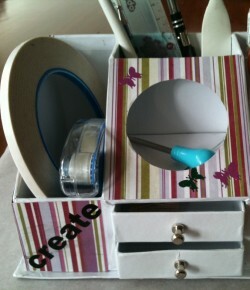 use your Stix 2 Double Sided tape and stick your next layer down. To add more height to your photo layer use two layers of the foam mount and you can do that with all the other embellishments like the banner in this layout. Using a Quilling tool glue stick or Stix2 Hobby and Craft PVA Glue with a metal nib pen add your twine and all the finer things on your layout. 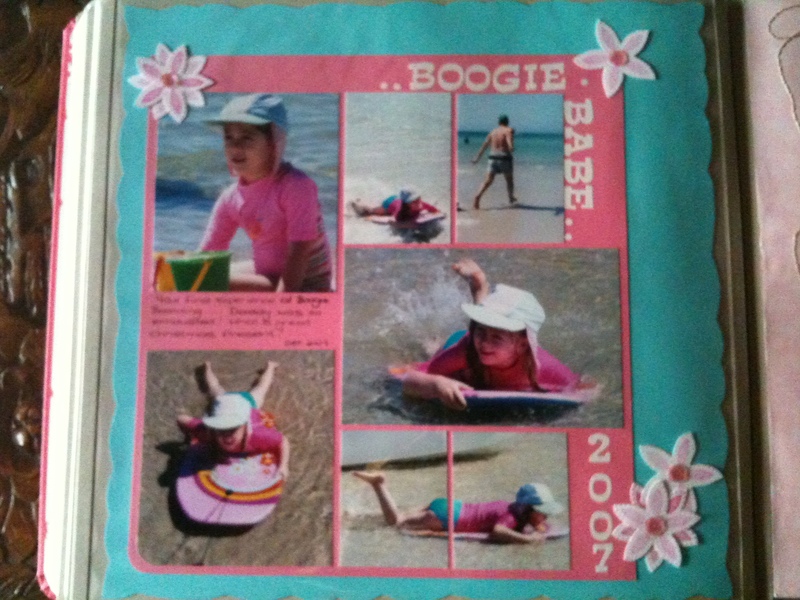 Hope this inspires you to get creative with some of the great products from Stix2 Anything…..
Having created many a beach page over the years I was looking for something different and something that was QUICK – I just needed a ‘creative‘ fix after a full on weekend. Alas – in my box of tricks I came across sequins (haha – those that know me know that sequins are not far away and quiet often not only in their boxes but down the sides of my lounge suite from endless hours of costume making). OOOps sorry I got carried away!! So I decided to add a little sparkle to this page. Actually, I don’t know if it was sparkle I was after or the fact that I LOVE, LOVE playing with the NEW Stix2 Pick Up Pencil! Every chance I get of late I’m finding an excuse to trial this nifty little tool. 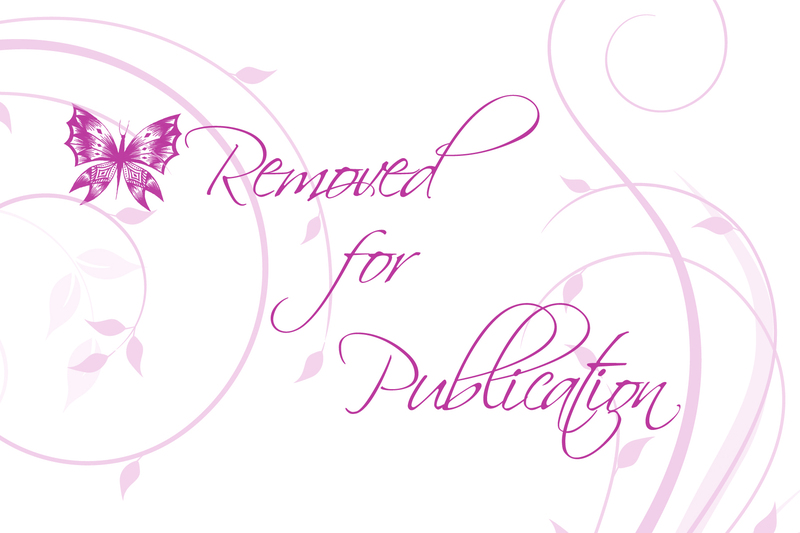 At first I questioned whether it was a gimmick but soon that question was answered – NO! It’s no gimmick it’s a tool to be had. 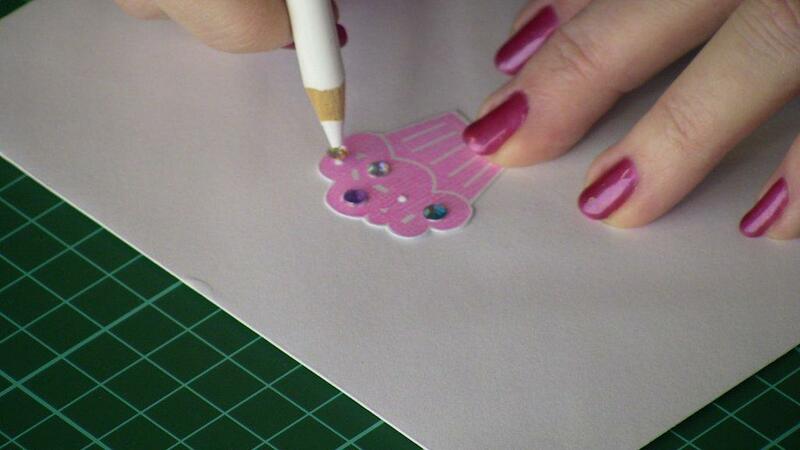 Not only does it pick up Gems, Rhinestones, Sequins, Beads, Pins and small shiny objects – it also picks up Wobbly Eyes and small pieces of Cardstock (yep perfect for my Punch Art creations and those small little eyes that need to be perfectly and effortlessly placed). Maybe it’s because I don’t like shopping …. but I always struggle when the time comes to buy a gift for a special occassion. A recent event was no different! What do I buy a little girl for her Naming Day Ceremony??? Sure there are Personalised Candles, Certificate Holders, Books, Photo Frames etc but nothing that grabbed me. So when nothing came to mind I locked myself away in the studio and did what felt right …. got creative!!! 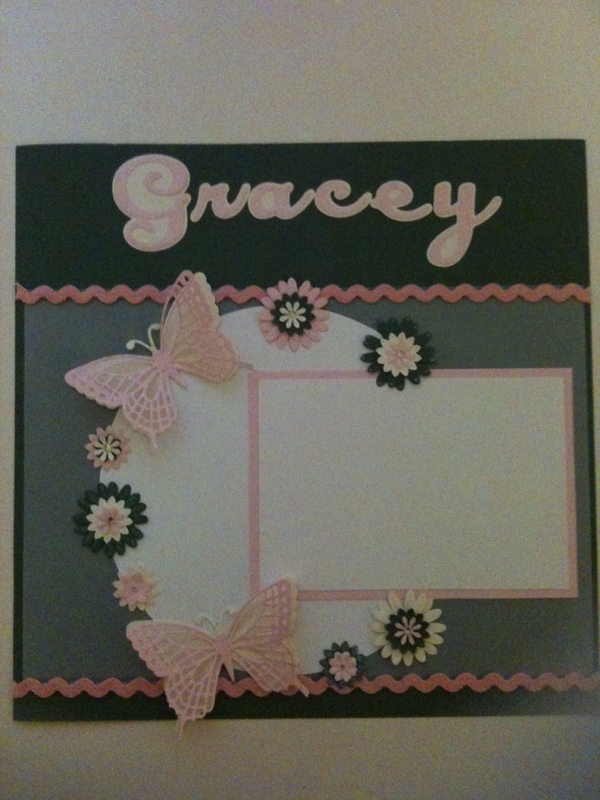 This is the end result – a Personalised Scrapbook Page which was then mounted in a Shadow Box! 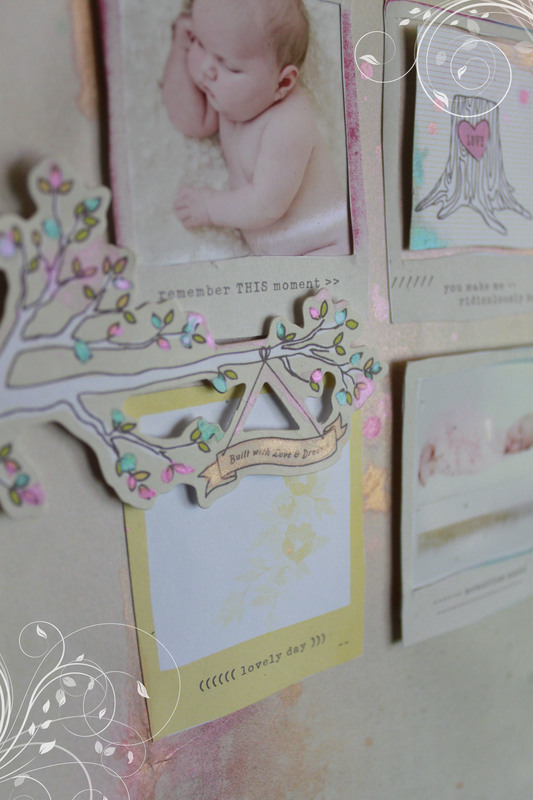 It was such a simple, sweet design with lots of glitz and dimension – I’m sure it will be the only one of it’s kind! Carl Daisy Punches, Stampin Up Daisy Punch. Stix2 Anything : Very Small Craft Dots (perfect to give Butterflies dimension), PVA Glue, Ultra Clear Tape, Tape Runner, Stix2 Pick Up Pencil – fabulous to pick up and place gems.